Last year, it was unbelievable. What happened wasn't supposed to happen. Having that many of the states best individuals and teams in the same meet with minimal qualifying positions was just unreal. 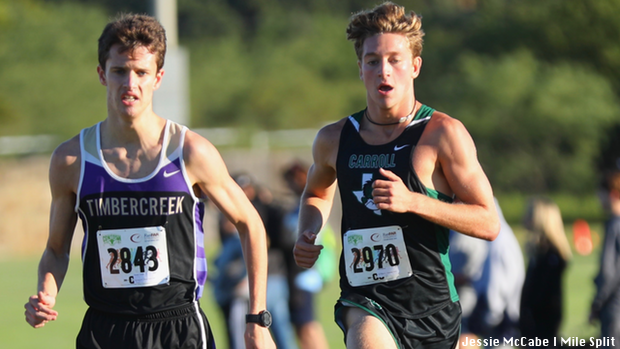 In the 2017 5-6A district meet, there were nine boys who ran sub 16s in the 5K and 13 girls under 19 minutes. Also on the girls side, four of the top five teams in the state were in this district meaning one of the teams would not advance. That outcome is exactly what happened as each athlete had a personal responsibility and each team ran as if their season would end that day. The final score was 60,60,61,64. The meet was that close where there was a tie for first place, third place was one point behind and the team failing to qualify missed out by only three points. This morning, it was on again, as the teams were running as if this was their state meet, in fact it just about was. The UIL realignment changed some of the participating teams, but the meet was just as explosive. On the boys side, There were even more boys under 16:00 with a total of ten. Led by Keller Timber Creek senior Braden Lange, the pace was fast and furious. Today, piggy backing off of his 14:14.47 performance at McNeil Inv. just over a week ago, Lange continued his impressive season with today's 15:14.20. Behind Lange, was Southlake Carroll (SLC) junior Nate Lannen who has been on fire all season long. Lannen,, who also ran a PR at McNeil with his 15:22.11, improved on that today going 15:18.70. As impressive as Lannen's individual performance was, it was the rest of his Dragons teammates that further cemented a solid day for Carroll. Today's SLC squad did something that is seldom done. They put their entire top five runners under 16:00. The last time they did that was at the 2017 UIL 6A state meet. SLC used a big 2-3 performance from Jack Myers and Tim McElaney to help bolster their squad. Myers and McElaney dashed to the line going 15:40.4 and 15:40.5 for fifth and sixth place overall. They were followed up by Drew Bliss (15:49.5) and Henry Gardner (15:55.6) to give SLC a 15:40 team average and a 36 second split. That stat line is the best team stat for a single meet by any team all season long. 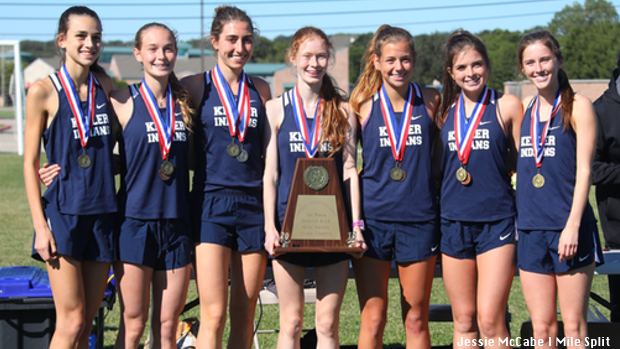 Keller (15:54 avg 0.32 split) and Northwest Eaton (16:17 avg 1:03 split) would also run well finishing second and third overall in the team standings and qualifying for the Region 1-6A meet. The girls race was another dandy. Individually, it was Denton Guyer's blazing Brynn Brown going sub 17 for the second race in a row. She won the district title going 16:56.80 as she appears to be enjoying a healthy sophomore season. 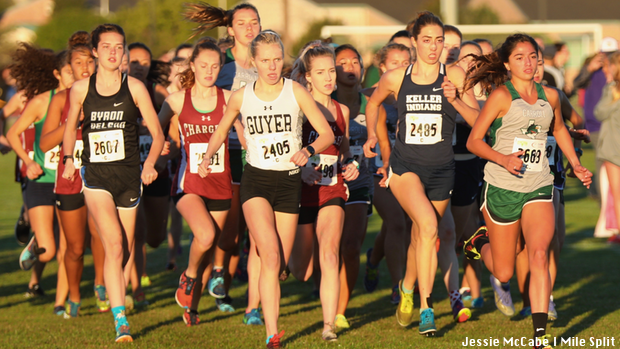 Following Brown was Keller star Isabel Van Camp who ran a PR 17:18.40 taking second place. Van Camp's performance led her Keller team to another big time victory. However, her big day wasn't just a solo performance. Coach Zaring's squad backed up last week's big win over Prosper with a win today. Junior Vera Thompson (18:13.40)and senior Cambria Clark (18:15.20) had huge days as they finished very close to each other and near the 18:00 mark to help solidify Keller's opportunity for a 3-peat next month. 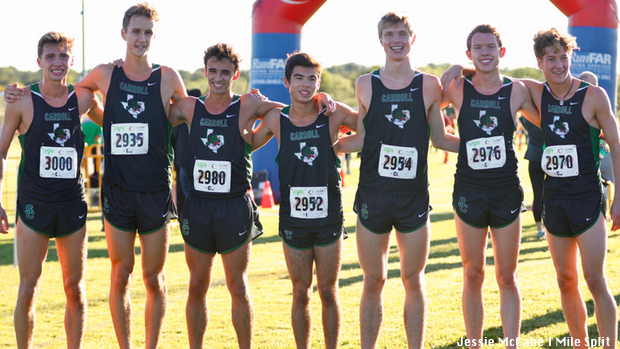 Keller ran a tough 18:25 team average, the second best team performance all season long behind Prosper's McNeil performance. For all that Keller did, they still had to run for every second, every place, and every point as SLC also ran outstanding today. If you had one race to use as an exhibit on how to run a team race, today's Lady Dragons performance is possibly one of the best case scenarios to use. Led by Payton Wichman (18:35.20), the varsity girls put on a clinic as they rose to the challenge placing one behind the other for their 1-6 runners. No lie, Carrol jerseys crossed line consecutively and all within 18 second of one another. To further demonstrate how "ON" the Carroll girls were today, they were just one runner away from seeing their entire top seven from finishing all together. There was one runner who placed in between their #6 and #7 runner keeping them from going 1-7. But, perhaps this is the stat of the week, the entire Carroll girls top seven all ran under 19:00. So how do you beat that? Well, trust me when I say, the Southlake Carroll Dragons were not finished breathing fire. Their JV girls and boys both cranked it up another notch as they both finished with perfect scores. The JV boys dominated their race finishing 1-8 and then 10-18. Seniors Hayden Coleman (15:58.40), Brett Naughton (16:06.70), and Vishnu Nair (16:13.00) paced the way for a ubiquitous SLC boys team. The official score for the team was 15 points, 16:10 avg, and a 0.21 split. However, if you split SLC's top 20 runners up in to teams of five, they could have went 1-4 in the team standings. Their top seven JV boys could have also finished third overall in the varsity race to qualify for regionals. The JV girls also dominated, the day they had will knock your socks off. Lauren Langenberg (18:59.90) and Riley Lackey (19:07.70) as they crossed the line first and it wasn't until 15th place when another runner not from SLC finished. Wait, there is more, Carroll girls picked right up from there and continuing until they had 22 of the top 25 finishers. The SLC JV girls finished with a perfect 15 point, 19:16 avg, and a 0.29 split.